Even at the market it’s rare to see apples that look like these ones at the Gorzynski Ornery Farm . 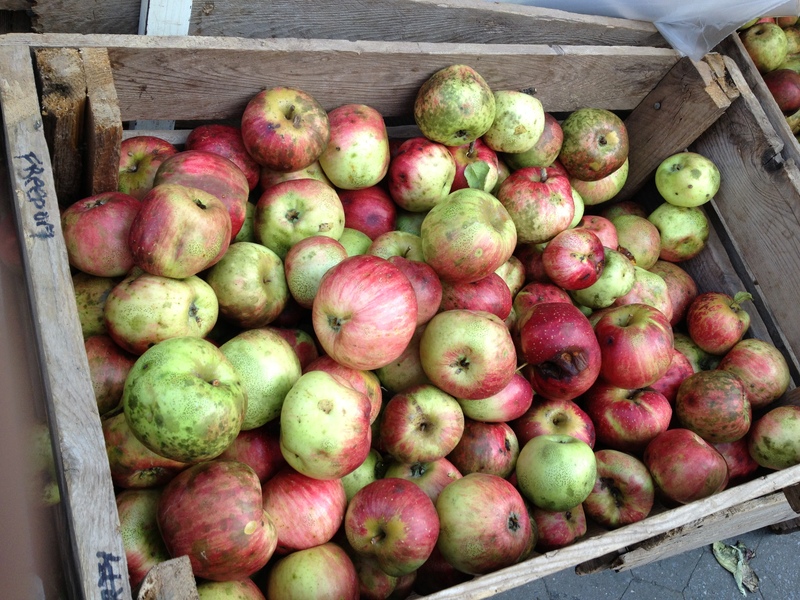 Most farmers spray their apples, and as far as I can tell none of the fruit at the Union Square market is organic except these apples. Eating local, for me, usually trumps organic, if I can buy local and organic great, but mostly what I want to do is support farmers and buy seasonal produce. What really is so striking is how different these apples look compared to the apples that we all have been brought up with the perfect unblemished orbs of juicy, crunchy, sweet, delight like the one Snow White bites into. Snow White’s perfect red delicious and the apples for sale at the Gorzynski farm stand only have a passing resemblance to each other. The reason for this is that apples are very pest prone and are the most pesticide contaminated fruit we eat (strawberries and peaches follow next). When you look at these apples compared to the ones in the grocery store you can understand why a bit of a beauty makeover might be called for. In the end the look of these apples didn’t stop me from buying some, tho I obviously had some apprehensions as the first thing I said when I handed them to the farmer (his son I believe) was: Are these cooking apples? He told me that there were several different varieties and that for the most part he ate his raw, but sure you could cook with them. In truth I was a bit put off because of the way they looked, it only took a second to realize, I had a choice: pesticides or nature? The one I ate first was green and sour, hard and delicious. I think I will cook with them next, but I also think I will be buying my apples from the Gorzynski’s farm from now on. 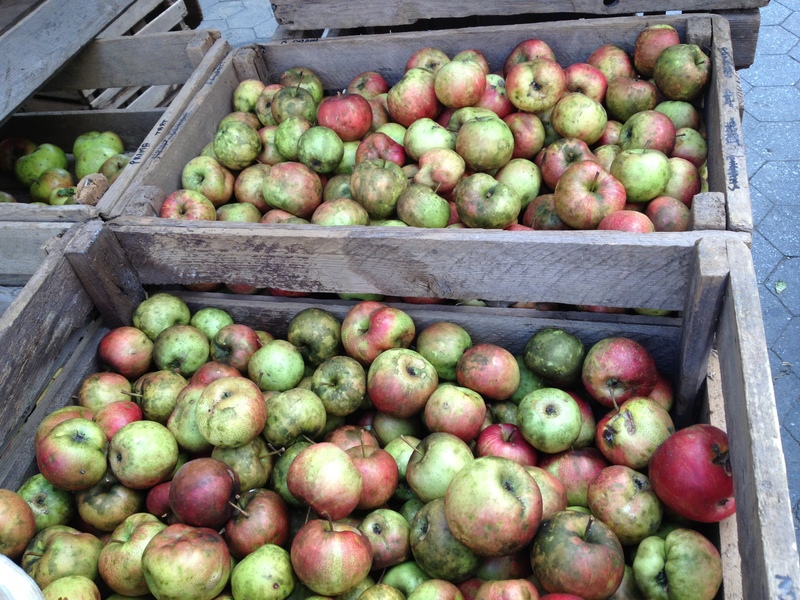 This entry was posted in NYC, Other Stuff, Politics and tagged gorzynski ornery farm, heirloom apples, no spray apples, pesticide contamination, pesticides. Bookmark the permalink. These remind me of the apples from the tree we had in the backyard when I was growing up. We didn’t spray it, so the apple weren’t perfect, but they were perfectly delicious. I’m not sure when I decided that superficial blemishes made the apples “bad”. After reading this, I went to the market and I bought the ugliest apples I could find.